The foot is divided into 4 large compartments (interosseous, medial, lateral, central) each including muscles, nerves and arteries, although it is debated whether there are actually 9 compartments, however, it is more practical to think of the foot in 4 compartments. Chronic (exertional) compartment syndrome can develop through over exertion during sporting activity. The muscles become fatigued and irritated resulting in an inflammatory response and swelling. Sports like football, motorcross, running, tennis and gymnastics can be risk factors. Training programmes may be inappropriate or incorrect footwear could be a cause. Other causes can be biomechanical abnormailities, limb length differences, muscle weakness or muscular tightness. Crush injuries are the most common cause of compartment syndromes of the foot , as well as snake bites, burns, too tightly fitted bandages or casts, metatarsal fractures, talus or calcaneus fractures, Chopart and/or Lisfranc joint dislocations,  steroid or creatine use which can cause muscles to increase in volume. Pain is one of the key symptoms for compartment syndrome, being severe and spontaneous or occurring during active exercises, often increasing in intensity as the activity continues, only resolving on rest. Typically, the pain is described as an aching and/or burning sensation. Compartment syndrome is characterised by an increase of the interstitial pressure with severe pain and pain associated with passive stretching of the muscles as a result. Other consequences consist of a reduced supply of blood and fluid supply to tissues. Awareness of the signs and symptoms specific to this syndrome are key to an accurate diagnosis, alongside an appropriate clinical examination. Where compartment syndrome is suspected, frequent examination is required in the acute phase, sometimes hourly, as muscle necrosis can occur within 3 hours. A quick and safe procedure to diagnose compartment syndrome is invasive measurement. where a needle is placed into the area, the only valuable test to diagnose this syndrome, otherwise known as Intracompartmental pressure monitoring (ICP). The American orthopaedic foot and ankle society scale visual analog scale have been used to measure quality of life after fasciotomy. Awareness of the complication, an appropriate clinical examination, comparison of the affected foot to the unaffected foot with attention to the syndrome's specific symptoms are most important. Pain levels are assessed through palpation and active and passive range of motion tests on the patient. Emergency decompressive fasciotomy is conducted with an acute compartment syndrome. Indication: when the intracompartmental pressure measurement has an absolute value of 30-45 mm Hg. Dual dorsal incision is the gold standard technique. A dorsal medial and lateral incision is made to release the compartments. A single medial incision is used to release all compartments, but it is technically more challenging. Complications: chronic pain and hypersensitivity are possible complications and can be difficult to manage. Sometimes claw toes develops. Nonoperative treatment is generally not successful. Post operatively, patients are advised to use ice and anti-inflammatory medication to reduce swelling and to rest. An exercises programme is given to improve muscle weakness and to stimulate proprioceptive sensors. Soft tissue massage  may be used to provide lymphatic drainage. Passive mobilisation of the ankle joint, the metatarsals and phalanges  is useful for increased range of motion and mobility of joints along with lower limb stretches. Orthotics   can be prescribed where there are biomechanical defaults. Toe curl: Place a towel beneath the feet of the patient and ask them to pull the towel towards them by curling the toes into the towel. Picking up marbles or other small objects: The patient has to claw their toes to be able to pick up the object from the floor. If pain or swelling occurs during or after exercise, elevate the foot and use ice to reduce the swelling. Compartment syndrome needs immediate surgical treatment to avoid ischemia, possible functional impairment and/or potential nerve damage of the foot. ↑ Frink M, Hildebrand F, Krettek C, Brand J, Hankemeier S. Compartment Syndrome of the Lower Leg and Foot. Clinical Orthopaedics and Related Research. 2010;468(4):940-950. ↑ 2.0 2.1 2.2 2.3 2.4 2.5 2.6 2.7 2.8 Frink M, Hildebrand F. Compartment syndrome of the lower leg and foot. Clin Orthop Relat Res. 2010 Apr; 468(4): 940-950. ↑ 5.0 5.1 Guyton GP, Shearman CM, Saltzman CL. 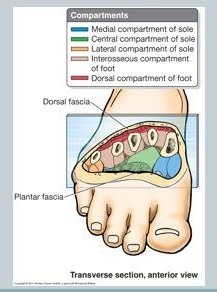 The compartments of the foot revisited. Rethinking the validity of cadaver infusion experiments. J Bone Joint Surg Br. 2001;83:245–249. ↑ 6.0 6.1 Manoli A, Weber TG. Fasciotomy of the foot: an anatomical study with special reference to release of the calcaneal compartment. Foot Ankle. 1990;10:267–275. ↑ Myerson, M. S. (1991). Management of compartment syndromes of the foot. Clinical orthopaedics and related research, 271, 239-248. ↑ Shereff, M. J. (1990). Compartment syndromes of the foot. Instructional course lectures, 39, 127. ↑ 14.0 14.1 Ulmer T. The clinical diagnosis of compartment syndrome of the lower leg: are clinical findings predictive of the disorder? J Orthop Trauma. 2002;16:572–577. ↑ Schünke M, Schulte E, Schumacher U, Voll M, Wesker K. Prometheus. Bohn Stafleu Van Loghum, Houten 2010. ↑ Vaillancourt C, Shrier I, Vandal A, Falk M, Rossignol M, Vernec A, Somogyi D. Acute compartment syndrome: How long before muscle necrosis occurs? CJEM. 2004;6:147–154. ↑ Whitesides TE, Jr, Haney TC, Harada H, Holmes HE, Morimoto K. A simple method for tissue pressure determination. Arch Surg. 1975;110:1311–1313. ↑ Han, F., Daruwalla, Z. J., Shen, L., and Kumar, V. P. (2015). A prospective study of surgical outcomes and quality of life in severe foot trauma and associated compartment syndrome after fasciotomy. The Journal of Foot and Ankle Surgery, 54(3), 417-423. ↑ Karadsheh M. Foot Compartment Syndrome. http://www.orthobullets.com (accessed 27 December 2016).